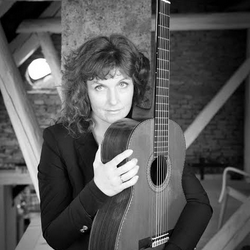 Monika Krajnc Štih teaches at the music school and the secondary school of arts in Velenje. She has dedicated a big part of her teaching career to developing guitar orchestra – not just at the music school in Velenje, but in the whole country. The orchestra of music school Velenje attends the show of guitar orchestras, which takes place in Žalec every two years and proudly presents with original Slovenian compositions, written or arranged for the orchestra. The show is recorded by RTV Slovenija, therefore their work is presented on the national level. Compositions and arrangements for the orchestra were written by Saša Lušić (Transibirian) and Mihael Hrustelj (Afinism, Pesem za Marušo, arrangement of Toto’s Africa). The orchestra has also collaborated with the choir of the secondary school in Velenje, and performed together Michael Jackson’s Earth Song, arranged by one of her students. The guitar orchestra of music school Velenje won a first prize and performed with the orchestra of ZGF on last year’s Zagreb Guitar Festival. She obtained her Bachelor’s Degree and Masters under the mentorship of Professor Martin Mysliveček at the Universität für Musik und darstellende Kunst in Graz, Austria. She has won many first prizes when competing solo or with chamber music. She released a CD of compositions for a guitar duo with her husband Boris. They were one of the first guitar duos in Slovenia. Since then, she has performed as a soloist or a member of various chamber ensembles. Her students are achieving the highest recognition awards and prizes at competitions on a national and international level.